Photography is very important when presenting your work for exhibitions or for sale. 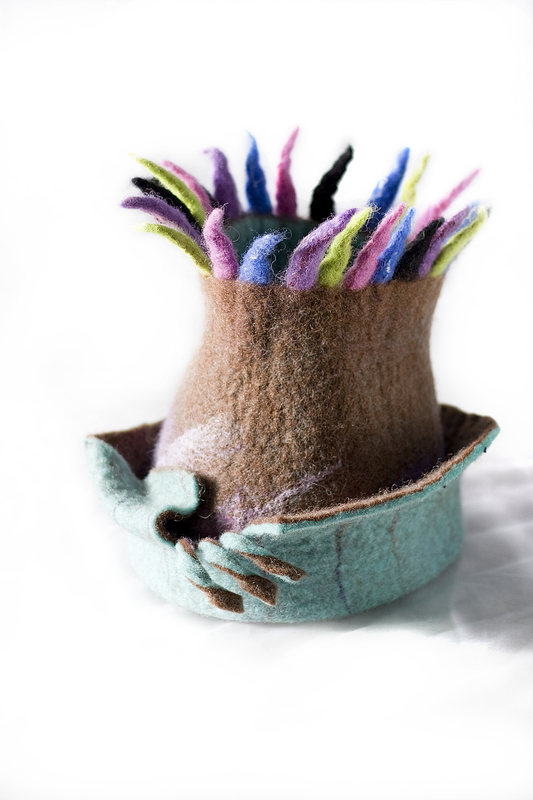 Entrants to the Feltmakers Ireland’s forthcoming exhibition Origins will need to submit photographs as part of the selection process. To help our members take the best possible pictures we have organised two workshops on Sunday 28th April from10-1pm and from 2-5pm (two separate 3 hours sessions). The workshops will take place In the Studio in the Phoenix Park and there will be a max. of 10 participants per session. The cost is €15 per person and this includes tea/coffee. Priority given to FI members, to book a place please email gabi.mcgrath@gmail.com. Joanna was the photographer for our book “Profiles in Felt”. 1 Know your camera – how to adjust and change settings in your own camera to get the best results. 2 Introduction to light – what different light situation are available and what is best for your piece. 3. Basic composition – the golden rules of composition in presenting your work. 4. Home made photo props – we will show you how to make low cost photo backgrounds and props from every day household items. 5. Basic post production – we will demonstrate a simple way to finish off your photographs on free software. For our workshop you need to bring your own camera, whatever you have, and an item to practice on.